Alongside the great symphonies and tone poems, music for the theatre played an important role in Jean Sibelius’s development. 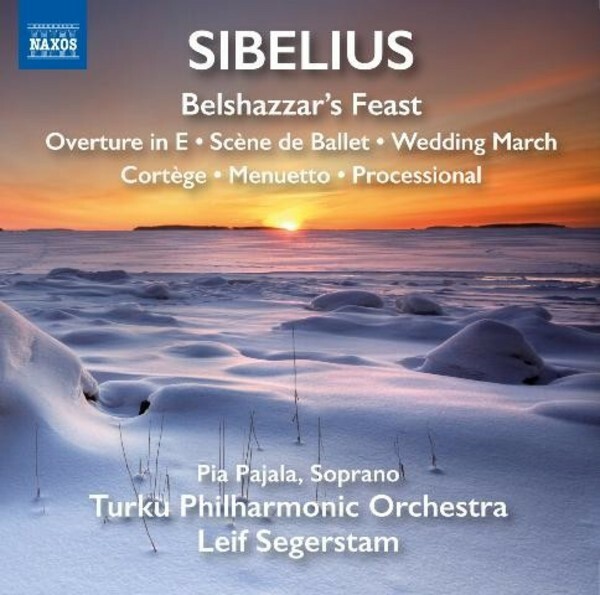 From exquisite nocturnal tranquillity to the macabre ‘Dance of Life’, Belshazzar’s Feast is an exotic tale of seduction and tragedy to which Sibelius responded with some of his most hauntingly beautiful writing for the stage. The early Menuetto and lively Cortège were considered good enough by the composer to be recycled for further stage productions, while the Overture in E and Scène de Ballet started life as Sibelius’s first attempt at composing a symphony. This is the second of a six-volume set of orchestral works by Jean Sibelius which explores his prolific but infrequently-heard work beyond the core oeuvre of the symphonies, violin concerto and tone poems. Conductor Leif Segerstam has been acclaimed for his many recordings with numerous orchestras, and was awarded the annual Finnish State Prize for Music in 2004 and in 2005 the highly esteemed Sibelius Medal. He is a conductor, composer, violinist and pianist with a prominent international career. Since 2012 he has been Chief Conductor of Turku Philharmonic Orchestra. From autumn 1997 to spring 2013 Leif Segerstam was Professor of Orchestra Conducting at the Sibelius Academy. He was awarded the 1999 Nordic Council Music Prize for his work “as a tireless champion of Scandinavian music” and the Swedish Cultural Foundation’s Prize for Music in 2003. In 2004 Leif Segerstam was awarded the annual Finnish State Prize for Music and in 2005 the highly esteemed Sibelius Medal. He has gained wide acclaim for his many recordings with different orchestras. While pursuing his conducting career, Segerstam has also produced an extensive oeuvre as a composer.